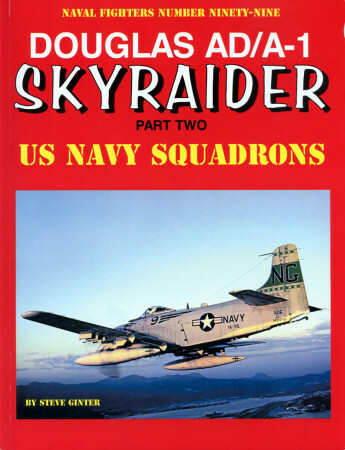 Ginter Books' superb study of the immortal Sandy continues with Douglas AD/A-1 Skyraider Part Two – no. 99 in the publisher's acclaimed "Naval Fighters" series. Like most of Steve Ginter's efforts, this one sports hundreds of photos and illustrations. But whereas the first installment included extensive tech-manual excerpts and variant notes, Part Two exclusively chronicles active-duty US Navy squadron service. Chapters cover, unit-by-unit, the total tale – both carrier and land-based. After squadron historical notes, each recaps Skyraider service and – where applicable – combat. Unit heraldry accompanies each section. Listings detail detachments. And aircraft shots – lots and lots of them – tincture text. Lather, rinse and repeat through US Navy AD/A-1 units – all in astonishing detail. Hobbyist? Ginter's typical model section will follow, the author avers, in Part Three – along with coverage of USN reserve, USMC, USAF and international Skyraider use. And therein lies this book's biggest disappointment: the third installment, Ginter reveals, "will not follow this volume directly and may not be addressed for a year or two".